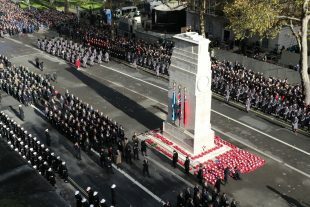 Today’s defence-related news includes extensive coverage of Remembrance Day and the Armistice centenary, as well as the Autonomous Warrior project. The nation fell silent yesterday to remember those killed and injured while fighting for their country. Remembrance Day dominates today's coverage, with extensive coverage in all of the leading national papers. Imagery relating to the historic event is on the front cover of the Times, Mirror, Sun, Mail, Express, Guardian and Metro. To be at the Cenotaph on Remembrance Sunday is a privilege and provides us with the opportunity for reflection along with millions of people in countries that continue to be strong allies. The First World War touched communities across the globe and I commend all those who have helped us remember the First World War generation. We will never forget them or the sacrifice of thousands of British and Commonwealth troops who have given their lives in other conflicts. The Daily Mail carries an article outlining Autonomous Warrior, as troops will today begin testing out over 70 examples of futuristic technology including enhanced surveillance drones and unmanned vehicles, on the fields of Salisbury Plain. The piece describes over 70 examples of technology, involving more than 200 people, that will be deployed during the experiment. Our troops now have the chance to test out a huge range of robotic kit in what will be the biggest exercise of its kind in our history. We’re always working with the brightest minds in Britain and across the world to see how they can support our military of the future, but now the frontrunners have the chance to prove what they can really do on a battlefield. This equipment could revolutionise our Armed Forces, keeping them safe and giving them the edge in an increasingly unstable world. Her Majesty The Queen and members of the Royal Family joined thousands of people to commemorate the centenary of the end of the First World War yesterday, as part of the traditional National Service of Remembrance. Crown copyright.